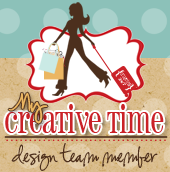 Hello everyone and welcome to another My Favorite Stamp of the Month at My Creative Time! This months stamp is the ""My Teacher Rocks Stamp Set"". This is a great set to own because it can be used all year round. I've used this a few times already for a few special teachers. For my project today, I made this simple but classy card. 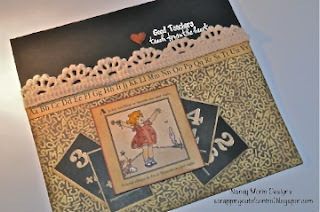 I used Graphic 45's ABC Primer Paper and black Recollections card stock. I embossed my sentiment using Ranger 's Seafoam white embossing powder. I cut the images from the G45 collection and popped them up using Stamp'in Up dimensional's. I finally got a chance to play with my Tim Holtz Distress markers and used them to color the image of the little girl. My little heart was stamped with the Any Day Bingo and Crossword Stamp Set. I finished the card off with some Prima lace. Thank you for stopping by and don't forget to link up your projects on Miss Emma's blog. 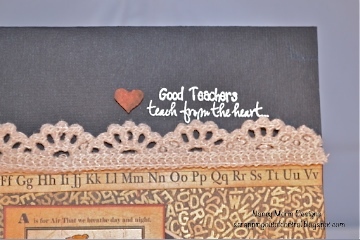 Also, this stamp set will be on sale only for a limited time so don't forget to visit Miss Emma's Shoppe. Big crafty hugs to you all! Nancy ~ GORGEOUS! I LOVE the details and Graphic 45 paper looks AMAZING! BEAUTIFUL job! Wow...you did a great job...such cute paper and all.